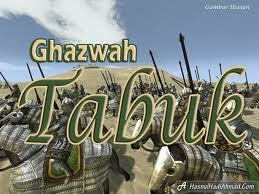 Ghazwah Tabuk – Ka’ab not going to war. Allah’s (reply to this was:) “Say, the fire of Jahannam is of more intense heat.” From amongst the Sahaabah , there were only three people who failed to join Nabi SAW. They were Muraarah bin Rabi, Hilal bin Umayyah and Ka’ab bin Malik . Muraarah had orchards of dates, laden with fruit. He convinced himself to stay behind saying: “I have taken part in all the battles so far. What possible harm would befall the Muslims, if I miss this one?” He feared the loss of the entire crop in his absence and this prevented him from going out. But when he realised his mistake, he gave away in charity the whole crop and garden also which had caused him to stay behind. Hadhrat Hilal’s case was different. Some of his family, who had been away for a long time, had just returned to Madinah. It was for their sake that he did not join the Battle. He had also participated in all the battles previously and thought (like Murarah ) that it would not matter much if he missed just that one battle. When he came to know of the seriousness of his mistake, he made up his mind to cut off all his connections with those relatives who had been the cause of this mistake. Hadhrat Ka’ab himself explains his story in detail, which is quoted in all books of Hadith.